A Rose On Ninth Street Available On DVD At Amazon! We are very excited to announce the release of A Rose On Ninth Street on DVD. We hope you've had the chance by now to stream the movie online but we also know that nothing beats having that DVD at home. So if you've been waiting or just want to add to your collection buy A Rose On Ninth Street on DVD today! As always we are grateful and humbled by your support! Thank you! "We get all kinds of films submitted to us. We currently have 900 hours worth of films and documentaries to go through. Our criteria in accepting a movie are that it be a quality film and well made," Skopinsky said. Those are the words of Art Skopinsky, President of Monarch Films and that's no easy fear! A Rose On Ninth Street is also available on Vimeo and can be viewed for only 2.99 or purchased for 3.99 in digital format. You can view the movie here! The Crystal Umbrella is Here! Available Now in Paperback and EBook Format! Welcome, this site was developed to share my past and future projects as an author of 2 fictional novels and my first attempt as a screenwriter of an independent film based on my first novel, A Rose on Ninth Street. My hope is that we can have a discussion on fiction and drama as a powerful tool to heal, inspire and uplift the soul! Who is Joseph F. Ruggiero? 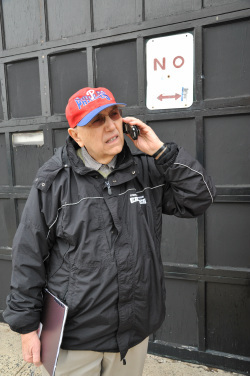 Joseph F. Ruggiero was born and raised in South Philadelphia He has spent his life working as a psychotherapist. He is an avid reader, walker, and family man. A member of the Secular Franciscan Order ,Ruggiero and his wife Bernadette have five children, and nine grandchildren. He has founded a most successful drug and alcohol treatment facility , Self Help Movement, INC. where he has worked for more than 40 years as the CEO. Dr. Ruggiero retired in 2010.He pursues his passion as a fiction writer believing deeply in the healing power of fiction: to uplift, inspire, entertain the soul, and bring about a change of values. He has written two novels, A Rose On Ninth Street, and Raggabooty. He has adopted his first novel into a screenplay, A Rose On Ninth Street, which was shot in South Philadelphia, and Bristol, PA. The film will be coming out in the future. Please check out the trailer www.aroseonninthstreet.com. Ruggiero is working on his third novel, Chrystal Umbrella, a serial murder in the gay community of Philadelphia. Your privacy is very important to us! We promise to never spam, share or sell your email address for any reason. We have completed the mini tour of screenings for A Rose On Ninth Street and had a great time doing it! We kicked the tour off in South Philadelphia in front of a crowd of a few hundred before heading to Northeast Philadelphia and then Bristol. We also enjoyed a private screening at the Ashburner Inn, in Northeast Philadelphia in front of a small crowd that included local politicians, business owners and judges as well as friends and family. Almost all of the feedback has been extremely positive. We'd like to thank all of you for your support! We were also able to stir quite a bit of interest in the novel, which the movie was based on, A Rose On Ninth Street, and for that we are grateful! The novel can be purchased at Authorhouse, Amazon or Barnes and Noble in either paperback or digital format. Please continue to check in as we have more exciting news for A Rose On Ninth Street coming soon!